Location photography is always fun, but challenging. Here is a very simple solution to getting nice lighting in an awkward location during a sunny day when you are alone. The key to getting this particular shot was to keep the family under that canvas top to avoid the harsh overhead sun from really causing problems. However, once under there, I had another problem…shade. The shade, combined with the surrounding light, made this a more challenging lighting situation. I did not want to fill this area with a speed light since that would make the overall light harsh. I also did not want to lose the ambient detail of the water, etc. The solution was to use a larger soft box. I placed the 2×3′ soft box camera right. The legs just made it on the dock and thank goodness it was not too windy. 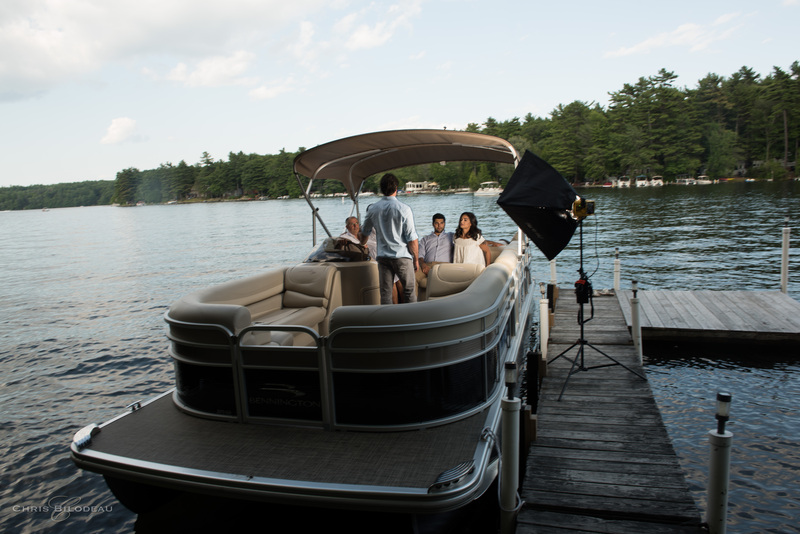 At about 1/2 power I could toss some soft light into that area and shoot from that cushion on the back right rear of the boat. This let me add a nice soft fill to the scene. Without this lighting set-up, I think the image would have suffered. You could not bounce flash a speed light on-camera and direct light would just make the image less appealing. No flash would cause the background to blow out and you would lose the highlights in order to preserve the foreground detail. This is a simple solution to a common location-based family session.